Astra International launched a new business line in residential property in Indonesia. 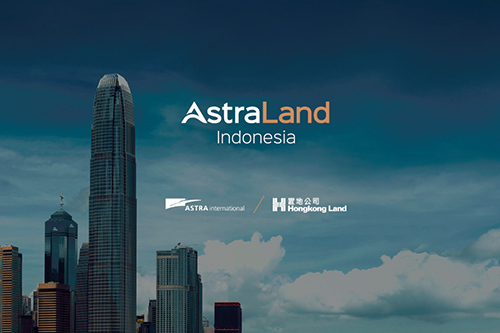 By cooperating with Hongkong Land Ltd, a leading developer in property investment, management and development as partners, Astra Land Indonesia was born with a 50:50 shareholding composition between Astra International and Hongkong Land Ltd.
PT. Astra Land Indonesia has a special mission in the residential field. As an extension of Astra Property, Astra Land currently has a township project which in its development process is partnering with PT. Modernland Realty and formed PT. Astra Modernland. The Lake Township project in building prepares housing, commercial areas, open spaces and apartments in the same area. ASYA lake township has launched in the fourth quarter of 2017 by preparing the development for the next 15 years. In addition, another residential project owned by Astra is Anandamaya Residences. Anandamaya Residences is a world-class residences which is expected to set a new standards for a vibrant urban lifestyle in Indonesia. This project started when Astra and Hongkong Land signed a cooperation agreement to develop the first project in the form of luxurious apartments in Indonesia through PT. Bahmayasa Bahtera. Located in center of Jakarta, Anandamaya consists of three tiered apartment towers with various facilities that supports high quality life. With apartment units with views of the capital city, world-class specifications, private pools for selected units and other facilities applied in a beautiful and green environment. After successfully developing Anandamaya Residences, Astra Land once again build a residential apartment units in the area of TB Simatupang namely, Arumaya. Arumaya built on an area of 2.6 hectares through PT. Brahmayasa Bahtera. Prior to the modern lifestyle, Arumaya provides an exclusive and elite life experience. Arumaya is still the only residential area providing infinity pool facilities in the TB Simatupang.